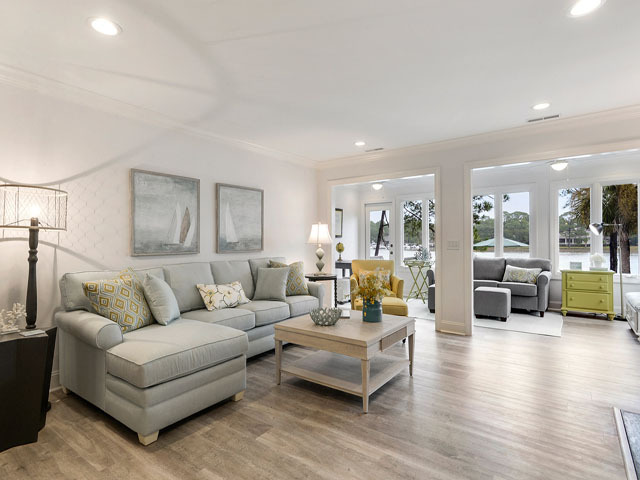 91 Baynard Cove has been added to your favorites! 91 Baynard Cove has been removed from your favorites! 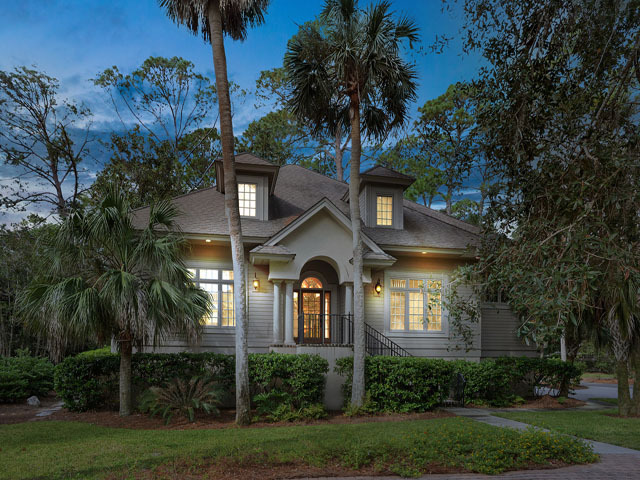 This lovely four bedroom home is located in the heart of famous Sea Pines Plantation. 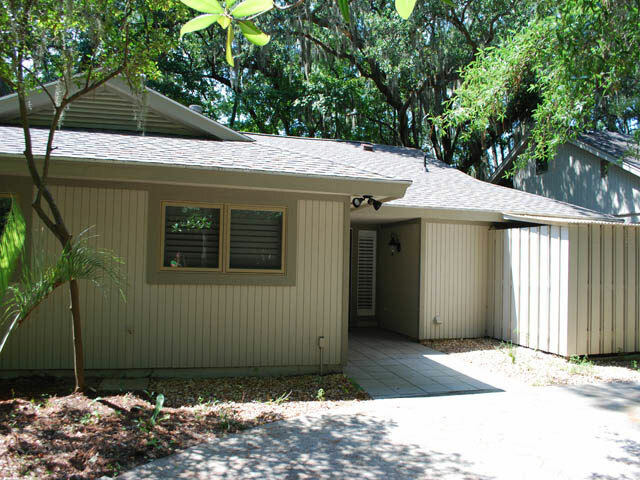 A golfers dream, it is only steps from Harbor Town Golf Course and a quick ride to the beach! Upon entry you walk into a cozy living room with a leather sectional and chairs. This area is open to the dining room with seating for 8 making it perfect for the family evenings together. French doors will lead you to the backyard. The fully equipped kitchen has a breakfast table for four. Just off the kitchen is the laundry room and den. The den has a large screen TV with DVD, sofa and two chairs. There is also a slider to a small deck with a table for four. The first bedroom is off of the kitchen and has a queen bed, TV with DVD, private bath with standing shower and a slider to the back deck. The rest of the bedrooms are on the other side of the house. Bedroom two features a queen bed, TV with DVD, and a private bathroom with double vanity and shower/tub combo. The third bedroom is next door and has two twins and shares a hall bath with a shower/tub combo. The master is down the hall, has a king bed, TV with DVD, and private bath with Jacuzzi tub and separate shower. There is also a slider to the back deck. The back yard is the highlight of the house. After a long day on the course or on the beach relax at your private tiki hut! The tiki hut features a bar large enough for eight people to sit comfortably, a small stove and fridge, propane grill, plus TV and sound system! 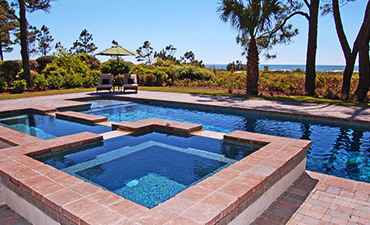 The very large pool with built in spa is approximately 24x30 and gets lots of sun. There are plenty of loungers to relax on and three tables each seating four for lunch or dinner under the stars. The back yard is completely fenced in and totally private. This is the perfect house for your next family vacation or golf outing!! *The pool and spa can be heated for an additional charge. *Parking at the Sea Pines Beach Club and Plantation Golf Club is $10 per day from Memorial Day weekend through Labor Day weekend.